Summer is coming and all eyes will be on Ohio since it’s the battleground state in the Barack Obama versus Mitt Romney presidential showdown. What cannot be forgotten amid the election hype is that Ohio is suffering from a growing hunger crisis. A report released on Friday from Feeding America, the nation’s largest food aid organization, showed that 18.1 percent of Ohio’s population is suffering from hunger. Last year the rate was 17 percent. This “food insecurity” affects over 2 million people in the state. The arrival of summer brings a new problem and it’s not just legions of reporters and campaign staffs trouncing through the state. When school ends many children lose access to one of the most important safety nets against hunger, the federal free or reduced price breakfast and lunch programs. This is an issue in Ohio and across the nation as the dilemma becomes how to distribute the food with most schools closed during the summer months. New feeding sites or mobile pantries are some of the options that have been utilized, but still huge gaps remain. Many needy children who receive the meals during the school year end up going without during the summer. A report from the Children’s Hunger Alliance showed that in Franklin County, Ohio there were over 78,000 children who received the free or reduced price school lunches in 2011. In the summer though just over 11,000 children received the meals. In some counties there were no summer feeding sites at all last year. This summer of 2012, with Ohio’s rate of hunger increasing, many children are at risk unless summer feeding expands quickly. One possible solution might involve offering citizens of Ohio a chance to buy CARE packages for needy children so they can have food assistance during the summer. The packages could be purchased at stores or online and shipped to needy children by foodbanks. This would be like a summer version of a program run by the Freestore Foodbank of Cincinnati called the Power Pack which gives children foods like rice, milk, and canned fruit to take home for the weekend during the school year. Perhaps it is fitting that so much election focus will be on Ohio this year as it can shine the light on the hunger crisis facing this state was well as the nation. Feeding America reports there are nearly 49 million Americans who suffer from hunger. Ohio incidentally has a storied history in the fight against hunger. It dates back to the early 1900’s to Cincinnati school teacher Ella Walsh who was a pioneer in developing school feeding. This spirit continued with support for the Belgian Relief Commission during World War I to the Ohio Food Train which helped win the peace after World War II by feeding the hungry. 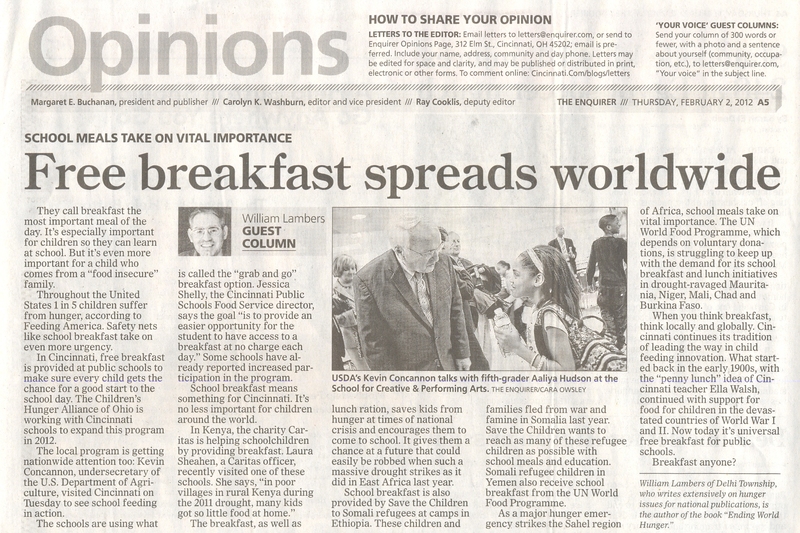 More recently it’s the expansion of school breakfast programs in Cincinnati. Ohio has an opportunity now to not only shape the course of the next presidency, but provide a turning point in the struggle to end hunger in America. Article first published as Romney-Obama Battleground State Suffering from Hunger Crisis on Blogcritics.